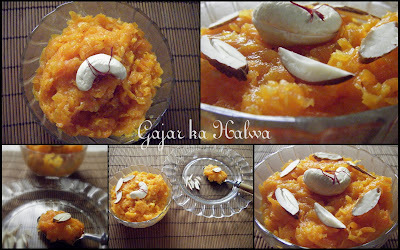 Easycooking: Gajar ka Halwa ~ Diwali Mithai!! A cliché scene from 80’s Hindi movies.Son[40+ at that] comes home from either abroad or after studies and the mother prepares the quintessential Gajar ka halwa to welcome the son home.Movies after movies,the same scene repeats but the GkH never goes out of fashion!! Last year I made this instant halwa courtesy my aunt Taramoushy.I got mixed reactions for it.Though some felt the instant method was very convenient compared to hours and hours of stirring and mixing,some felt that it was worth the effort to have “that” taste for the halwa.Honestly,I can give “that” taste a miss;).By the end of grating mounds of carrot,I am tired as hell and even the thought of stirring the big batch till it cooks gives me the creeps. I came across this super simple recipe for GkH in Tarla Dalal’s cookbook.It requires only a teeny bit of ghee and a teenier bit of sugar.Since the word d-i-e-t is always there at the back of mind,I though of trying this one out as a diet halwa,almost. In a microwave safe bowl,combine ghee and grated carrots. Microwave covered on HIGH for 4 minutes. Add the milk powder,sugar,cardamom powderand mix well. Microwave covered on HIGH for 2 minutes. Garnish with sliced nuts,saffron strands. Indulge and share with your ♥loved♥ ones. Gajar ka Halwa goes to Priya's event Diwali 2009. That carrot halwa looks yum...I normally m ake them adding the condesed milk, which is really yum and calorific:)...This sounds too good for health conscious ppl...I wish there was a healthy alternative as such for all sweets....SIGH! Just lvoe this carrot halwa, beautiful presentation Divya! Wow.. delicious all-time favt! Execellent colour and pictures..! Wow beautifulful adn sweety delicous. Wish you and your family a very Happy Deepavali! Halwa looks very delicious. Another favourite of ours. Looks lovely. Wishing you and family a Happy Diwali. Looks really good! Happy Diwali to you! My favorite,long time since i made this! Looks lovely! A simple sweet that never fails to satiate!